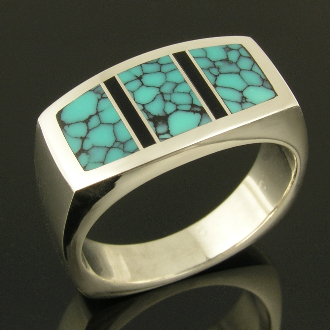 Unique handmade man's sterling silver ring inlaid with spiderweb turquoise and black onyx by Mark Hileman. Spiderweb turquoise occurs when iron oxide fills in cracks or voids in the turquoise. The pattern created is random, with the webbing varying in thickness from extremely thin to wide bands. There is no set pattern or width to the veining. The pattern created is considered attractive and raises the value of the turquoise. In the Southwest and the Far East, spiderweb turquoise is very popular and commands the very highest prices. This ring is 11mm wide and is shown in a size 10 3/4 for scale. The ring can be special ordered in other sizes and inlay materials. Special order usually take 4 to 6 weeks to complete. The ring is stamped sterling silver and signed "MMH" on the inside by the artist. *The turquoise in this ring is no longer available. We have several other spiderweb turquoise choices. Please contact us for details.